The Alwyn Vintcent will be making its way to Villiersdorp on Monday- 25 June 2012 to be finally laid to rest in our beautiful town. She weighs 120 tons, so you can imagine that this is no small picnic and once here, this asset is going to wonders for our town as an attraction and play a massive role for Heritage Tourism in South Africa. 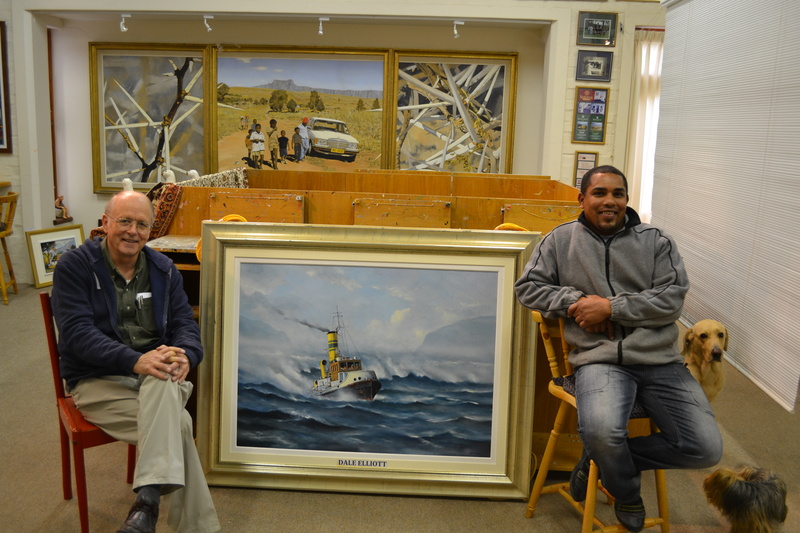 The painting in the photo is going to be attached to the vessel as it embarks on its’ four day journey from The Cape Town V&A Water Front to Villiersdorp, travelling through many towns in the Swartland and Overberg to get here. This entry was posted in 'Econo Frames', Dale's Paintings, Elliott Art Gallery- Villiersdorp, Knysna, Media, News, Subject matter, Villiersdorp. Bookmark the permalink.